Explore neighboring cities and areas close to Atlanta. Choose convenience with small-town comfort in the East Point/College Park Airport area. Take MARTA to Decatur for an artsy, quaint, local feel with chef-owned restaurants. Many more neighborhoods in the Atlanta metro area are a group tour, quick rideshare, cab or short drive away with plenty of sites to explore. 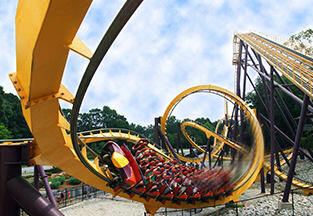 Save 40% on admission tickets to 5 must-see Atlanta attractions! Watch the video for cool music and neighborhoods. Experience small-town charm with big-city sophistication. The Airport area is only a few MARTA stops south from Downtown Atlanta and is chock full of unique dining and entertainment options. Just east of Downtown, Decatur is one of the best places to go to see how locals live. Sit back on Decatur Square and enjoy patio dining, coffee or just soaking in the sun. No matter what’s on your agenda, Decatur is a quick ride away and full of fun. Discover neighboring cities and areas close to Atlanta. From charming neighborhoods right on MARTA, to easy day trips to the North Georgia mountains, there are many new areas to explore.